The warm weather melted our snow and I am not unhappy about this, however I am wishing now for springtime.. I like to plant my veggie garden and the blossoms of my flowers around the house. It makes the place seem alittle more alive. The butterflies here represent that as well. 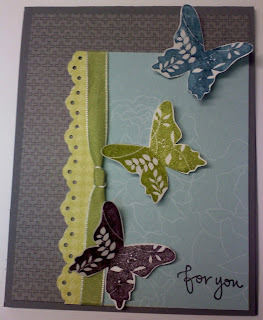 I cut them out and embossed them with clear embossing. I bent them before I glued them down to pop when the owner of the card opened the envelope.